The Pittsburgh Steelers have ended at least one contract distraction before training camp starts. The team and coach Mike Tomlin agreed to an extension on Tuesday July 24, that will keep him on the sideline through at least 2016. Financial terms were not disclosed. 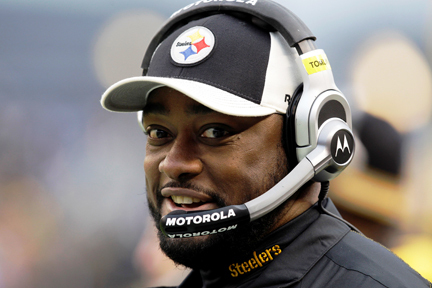 Tomlin’s previous deal expired at the end of the 2013 season. The 40-year-old Tomlin, a surprise choice to replace Bill Cowher following the 2006 season, is 55-25 with the Steelers, winning three AFC North titles, two AFC championships and the 2009 Super Bowl. “Mike is one of the top head coaches in the National Football League and we are thrilled he will continue to lead our team as we pursue another Super Bowl title,” team president Art Rooney said in a statement. Under Tomlin’s guidance the Steelers have consistently been among the best teams in the league. Pittsburgh has ranked first in defense three times during his tenure and averaged seven Pro Bowl selections a year. The Steelers began camp July 25 and will likely do it without wide receiver Mike Wallace, who has yet to sign his one-year tender.